At the PC Gaming Show today, Blizzard revealed details about Heroes of the Storm's first major content drop, a Diablo 3 themed update called Eternal Conflict. It will include the new hero King Leoric (who was previously teased at BlizzCon), the recently revealed Butcher hero and the Battlefield of Eternity map, the Monk class as a newly announced hero from Diablo 3, a special in-game event with Diablo's Treasure Goblins, and more. Executive Producer Chris Sigaty said "Eternal Conflict represents this big moment for us because it's the first Blizzard world entering [Heroes of the Storm]." We've known King Leoric would be coming since BlizzCon, but this is the first close look we've gotten since then. King Leoric is a warrior with a kit focused on controlling the battlefield. Game Director Dustin Browder said "When he dies, he turns into a wraith and he stays on the battlefield." Leoric can't deal any damage when he is a wraith, but the damage he would have dealt goes towards shortening his death timer. 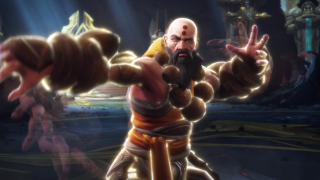 We also got a look at the newly announced is the Monk hero, who will be the first Diablo support character coming to the game. Browder also discussed a brand new kind of quest coming to Heroes of the Storm, a special Eternal Conflict Treasure Goblin quest. A new daily quest will be given to players—separate from their regular daily quests—to kill a Treasure Goblin. A Treasure Goblin has a chance to spawn in matches before the gates are opened. If you are the one to kill it, you can be rewarded with special portraits and gold for your account.